Some albums are "good", "great" even, but you don’t return to them that often. 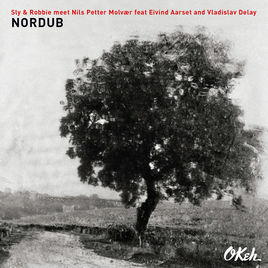 Other albums, like Nordub, a new release featuring drummer Sly Dunbar and bassist Robbie Shakespeare, get right under your skin. There’s a moment in the middle of White Scarf which is sheer Nordic bliss, washes of glassy sound, multiplexed muted trumpet (from Norwegian trumpeter Nils Petter Molvær) with noises that might have come from deep in the dark recesses of a haunted machine – a battered laptop or an ancient analogue mixing desk. The Dub genre has prompted some interesting collaborations. We’ve heard the explorations of Bill Laswell (incorporating Sly and Robbie) plus the benign, seductive appropriation of the Gotan Project. King Tubby, one of Dub Reggae’s most innovative artists, was known to have been a big jazz collector, who sought to achieve the freedom of his favourite improvisers in this freewheeling approach to record-making, using the mixing desk as an instrument – see ‘Ghosts in the machine’ (Guardian, 2004). Sly and Robbie have been Reggae royalty and first-call sessioneers for donkey’s years – working with everyone from Grace Jones and Ian Dury to Shaggy and Serge Gainsbourg. They are prolific producers and artists, too, and their influence on popular music is hard to overstate. The Nordub project brings their backline skills to the front in a new way, in a glorious meeting of empathetic talents. There’s a gentle firmness to the drums and bass that complements Eivind Aarset’s icy guitar soundscapes. Defiant analogue effects (the "ping" of overdriven spring reverb; tape delay that spins on the cusp of feedback) rub up happily against the cleaner digital sounds and echoes we expect from European blue-screen nu-jazz. Shakespeare sings on How Long (an original, not the Paul Carrack hit) and Was In The Blues. The two vocal numbers add pleasing warmth to the otherwise instrumental and electric album. Nils Petter Molvær leads assuredly without dominating – the rapport between his trumpet and Aarset’s guitar is as thrilling as it was on Khmer and Solid Ether nearly two decades ago. The wonderfully named Finnish co-producer Vladislav Delay (live dub, percussion) fills in the sonic spaces between soloists and celebrated rhythm section. Yet if you let the album wash around your sound system for a while, you realise that this is a kind of music where "Everyone solos and nobody solos", to quote Weather Report’s famous dictum. Standout tracks include If I Gave You My Love and European Express but there are no duds. The album is sensitively produced by Jan Bang, and well sequenced, but it sounds just as good on shuffle play. Nordub is that rare thing, an uncompromising crossover album – a contemporary work that already sounds like one for the ages.